Blend, blend, blend! Apply and blend with this elegant blending brush. 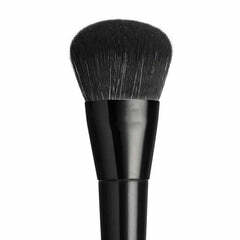 This handcrafted blending brush can be used for applying eyeshadows as well as concealers. With its incredibly soft cruelty-free bristles, it provides an elegant and professional level of blending and contouring for a camera-ready result. The brush is made of cruelty-free vegan bristles with an incredible soft feel, which is gentle on your skin. 19.6cm full length. Bristles - 1.5cm high, and 1cm wide.